Try the excellent Desima power-glue! In order to professionally and securely lay textile wallcoverings and to achieve a long-lasting result, a suitable adhesive is essential. The wallcovering paste should only contain minimal water so that it has sufficient adhesion. The weight of our wallcoverings is between 250-400g/m². We recommend using our Desima Power Glue to ensure sufficient bonding of our exclusive wallcoverings. This ready to use adhesive guarantees perfect results and is appreciated by countless decorators using this product. 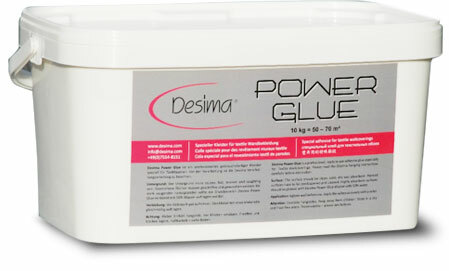 Desima Power Glue is available in 10kg tubs with a covering power of 50-60 m2 according to the underground.